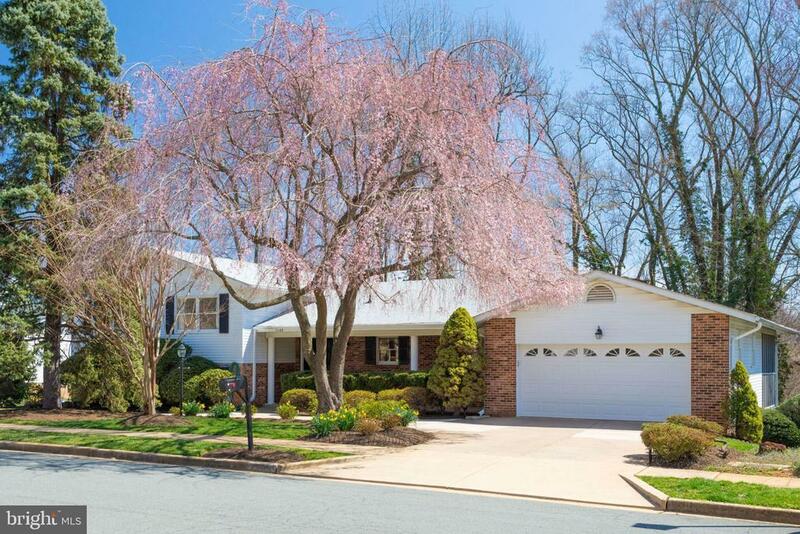 Enjoy all that Falls Church has to offer in this fabulous 4 bedroom, 4 bathroom home with close to 4000 square feet of living area located in a quiet, non HOA neighborhood of cul-de-sac streets. A commuters dream ~ it~s minutes from 66, 495, and West Falls Church metro. Also near the major shopping and restaurants in Tysons Corner, all downtown DC attractions, and in the highly sought after McLean school pyramid. The renovated eat-in kitchen showcases stainless steel appliances, including a Wolf sub zero wine/beverage cooler; maple cabinetry; SileStone countertops; ceramic tile floor and backsplash; Nutone music and communication center w/8 additional speakers; Hunter Douglas Roman Shades and under cabinet lighting. For formal entertaining you will love the light filled dining and living room with gleaming hardwood floors. Off the dining room enjoy the sights and sounds of your treed lot in the screened-in porch (hot tub does not convey).A few short steps to the upper level is where you will find a huge master bedroom suite complete with a sitting area, wall of mirrored closets, separate walk-in closet and beautiful hardwood floors. The master bath has been renovated with natural cherry finish cabinetry, dual sinks, ceramic tile floor, frameless shower door, dual showerheads and separate water closet. Two additional bedrooms and a renovated bathroom complete the upper level.The family room/den is a great place to host your neighbors for the Super Bowl or March Madness, or just enjoy a quiet evening in front of the wood burning fireplace. Warm paneled walls, carpeted floors, a bar sink and the ability to walk out onto one of two decks to enjoy a sunset in a natural setting. The fourth bedroom and separate renovated bath would make a perfect au pair suite. The spacious and convenient laundry room is also on this level.The basement has endless possibilities but the largest space is currently being utilized as an exercise room. After a vigorous workout, you have the choice of stepping into the Jacuzzi/Whirlpool tub or your personal Viking Sauna all located in the fourth bathroom.Expect neighbors to stop and enjoy your beautifully landscaped yard including a ~one of a kind~ giant weeping cherry tree in a beautifully landscaped bed within your circular concrete driveway. Combined with your two-car garage you have ample convenient parking for your visitors. All the major components have been replaced; new HVAC, new hot water heater with expansion tank, newer AC unit, replaced roof in 2012, radon remediation system with new motor, termite system plus, garage door, and five outer doors.Welcome to your new ~turnkey~ home!